I tried to find a word that meant surfing the shores of the internet via Google and picking on interesting snippets that were washed up, but I failed. So net-combing (instead of beach combing) it is. Anyway, while netcombing to see how far and wide the latest stories about us had propagated, I found an article in a travel ezine and the picture stopped me in my tracks. Just exactly what IS this? A toy (the red propeller blades would hint at that)? Someone's first play with a digital rendering program? And where is it exactly? Mars in the future with water? The mind boggles. 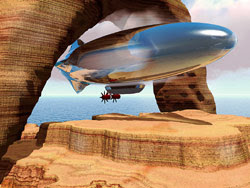 I can't understand why they don't use a proper picture of a Zeppelin. It's not like you can't easily get one. Is that a Zeppelin in your pocket..?